There comes a time in everyone's life when a loved one passes away. We all wouldn't want to think too much about this dreaded day when someone near and dear to us breathes their last breath and passes on, but it is something many, if not all of us have to deal with at one point or another. 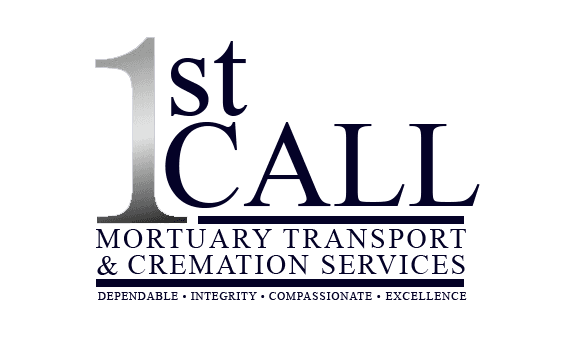 When it happens, we, of course, want our departed loved one's remains to be treated with utmost dignity and respect, especially when moving the body from the hospital, the nursing home, their home, or anywhere else from which they'll be transported. If you're a funeral parlor manager or operator, and are in need of a quality mortuary transport services, you've come to the right place! Here at 1st Call Transport, we take pride in delivering unmatched quality service that goes beyond the norm. We serve our clients with D.I.C.E. (Dependability, Integrity, Compassion, Excellence) We are a 1st call removal and transport company with trained and qualified removal techs. We are a premier support service, mortuary transportation provider for funeral homes, coroner's, etc. Providing hospital, nursing home, residential removals, airport pickup / delivery, casket, long haul, and crematory transportation. Our trained removal technicians remove the deceased from location and transfer to funeral home, crematory, or coroner.